This letter is to ask forgiveness for the late night interruption of your deep sleep. I, too, had found that place of wonderful rest when I heard him. My dog. Barking. Barking, and barking, and barking. The more I tried to ignore it, the louder and faster it came. Finally, realizing that something had to be done, I rose from bed, ready to give “it” to him for getting us run out of the neighborhood. On the way to the door, I notice my whole family is STILL asleep. How can that happen with such a ruckus going on? I get to the back door, and it sounds like he is on the porch, barking his head off, literally. He’s NEVER done that before. Finally, I get the courage to open the door, and see that he is going BEZERK over something that is cornered between the air conditioner unit and the wall of our house. I yell at him, tell him to stop – but he is NOT listening to me at all…..growling and barking all in the same breath…nonstop, running from one side of the a/c unit to the next and back. I decide it is probably a cat, but go back to the bedroom to grab some shoes and a flashlight. On the way, I pass the daughter asleep on the couch, the sons asleep in their room, and the husband snoring away. Really!? I mean, the world is falling at this moment, what sounds like WWIII is going on right outside our house, and now the door is open so the sound is even MORE amplified….and they are ALL asleep!? So, still in my nightgown and flip flops, flashlight in hand, I open the screen door again, and aim the flashlight at the suspected area, and this is what I saw…. This face, exactly…..teeth, eyes, pointy nose and all!!! Scare-y! I instinctively turned away from it once I realized there was evilness looking at me. Then, when I turned back for another look, I guess it distracted it long enough for my dog to go in for the “kill”. His big powerful jaws closed down on its’ neck and then all I heard was the sound of his footsteps as he ran off with it. 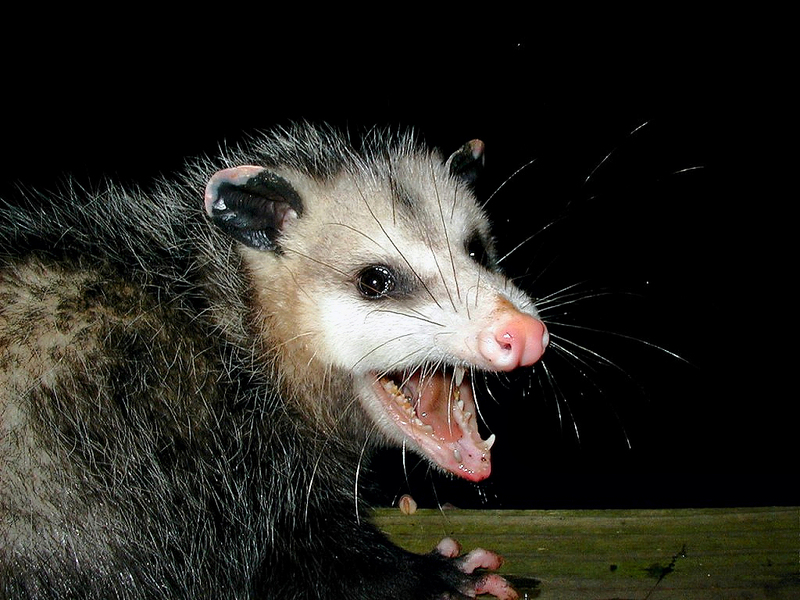 He was like a “shadow”…gone with the possum in a flash. I didn’t know where, I didn’t care to look either!!! So, please, dear neighbor, forgive us today. Know that if a possum invades our community, Toby the Lab will definately protect us from it.